Have tons of cooked corned beef in your fridge from St. Patrick's Day? Here are lots of terrific ideas and recipes that utilize corned beef leftovers. Why wait 'til the last minute to prepare your Easter dinner? Try making these freezer friendly dishes in advance to make your Easter Dinner worry and hassle free. Add some of the color and exuberance of Spring to your Easter table with these quick, easy, and inexpensive ideas. 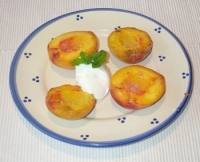 Looking for an elegant, yet easy, menu for this Easter? Look no farther than this wonderful menu based around fresh spring ingredients and simple preparations. We have shared our favorite traditional Passover recipes in this easy menu. Our menu has just a hint of citrus flavors intertwining between many of the dishes and all of the food is aromatic and evocative of the Passover celebration and a variety of different cultures. Looking for something traditional and comforting this Easter? Here is our traditional Easter menu with some of our favorite Easter recipes. All the dishes are very quick and easy to prepare and use very easy to find, inexpensive ingredients. Looking to celebrate the hint of Spring that is in the air? Then try this great menu for six. 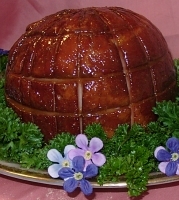 Tired of the same old boring ham made with that scary looking red glaze out of a jar? 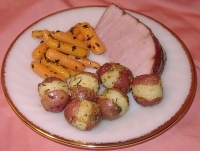 Try these simple and easy ham glazes to perk up your Easter ham. Shades of palest and salmon pink mix with the bright gold of daffodils for an arrangment that is sunny and bright - just in time for Spring. Learn more about how to grill chicken safely and so that it is full of flavor - just in time for Spring entertaining. Can't get the kids to eat Easter dinner? Try this cute menu that both kids and adults will enjoy based on family friendly dishes and clever names. Looking for some old fashioned recipes? Here are some very traditional recipes that have been modernized for today's lifestyle. 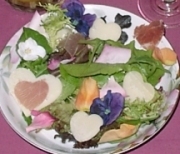 We assembled some of the great recipes by Karen Goodale, RecipeBox.net's webmistress, for this wonderful menu for 8. Delight your children with this fun and easy to make centerpiece made from inexpensive materials. Parties with no set seating and tables are easy on the host, but are oftentimes rough on the guest (and your carpet!). Read this informative article about food that is easy to serve and eat...when you don't have a seat. We work with flowers a lot and have discovered a few tips and tricks to help make our lives easier when working flowers. Discover our tips for helping your flowers last longer, look better, work better, and cost less...all while saving you tons of precious time.